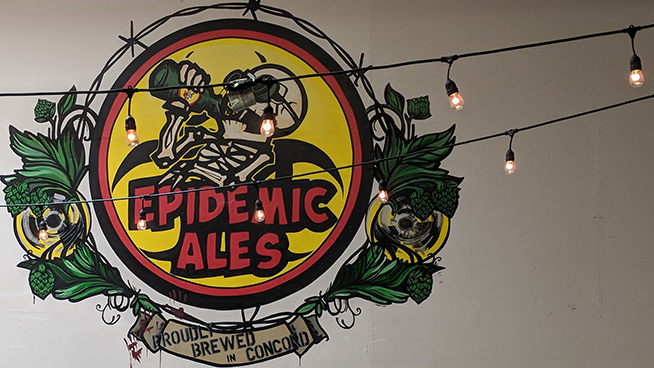 After starting out as merely a hobby, Epidemic Ales sets out to brew the best beers in town. Upon two friends brewing up some healthy competition, now owners Holly and Aki dared each other to see who could brew the better beer..and basically have yet to stop. The two set to focus on quality, bold and unique flavors that leave a lasting impressions. Now if you don’t believe just how unique there beers are, maybe the blend of supernatural and horror undertones will draw you in. Outside of the skeleton being the center of the logo, these beers are titled after what you would expect from fans of zombie enthusiasts – like Zombrew IPA, their flagship brew that tops out at 7% ABV and is layered with five hops! A few taproom favorites are the Affliction Amber, a smooth maltiness at 5.5% ABV, and for this season the World’s Ends, a clean and crisp lager that will pair perfectly with The Bay’s Indian summer weather at a 4.5% ABV. My favorite? The Nutty But Nice Peanut Butter Stout, a smooth decadent stout topped of at 8.5% ABV. This unique stout starts with utilizing the base of their Nightshade Stout and then is mixed with some secret ingredients until it basically tastes like a chocolate peanut butter cup. I had to get a crowler of it. THAT. GOOD.